In the September 2007 issue of National Geographic Adventure, Lynchburg was picked as one of the best 50 places to Live and Play in the nation and was the only place in The Commonwealth of Virginia mentioned. James River Heritage Trail: Eight miles of paved trail with an additional 20 miles of natural surface, featuring abandoned rail tunnels and views of the historic Lynchburg Riverfront. Great for hiking, biking or jogging. For Bike Rentals contact Bikes Unlimited in downtown Lynchburg at 1312 Jefferson Street. Phone 434.385.4157 or www.bikesunlimited.com. Blackwater Creek, an urban path: Located within the center of the city and officially dedicated on May 17, 1979 the Blackwater Creek Natural Area and its trails were recognized by the federal government to be of such significance that they were proclaimed a part of the National Recreational Trail System in 1981. Hiking, biking or jogging along the trails you may encounter deer, fox, raccoons, beavers, hawks, owls, blue herons and wild turkeys. The path is approximately 5.7 miles and can be accessed at the foot of Cabell Street just across the pedestrian bridge. The main paved bike route follows an old railroad bed on a nearly level grade. The terrain is certainly not flat as you wander past numerous places where buildings and the railroad had to cut through the hillside or fill in small ravines in order to lay down track on a suitable railroad grade. The Blackwater Creek Bikeway connects to the River Walk, which extends across Perciville’s Island and on into Amherst County. For Bike Rentals contact Bikes Unlimited in downtown Lynchburg at 1312 Jefferson Street. Phone 434.385.4157 or www.bikesunlimited.com. Paddle Away: North of Lynchburg, experienced canoeists and kayakers can delight in nine miles of spectacular mountain scenery on the Tye River by putting in on VA 56 near Hash. High cliffs, interesting rock foundations and steep slopes covered by heavy forest line the river. Be prepared for drops, narrow turns, and nearly continuos Class II-IV rapid for the first half; things mellow out a bit before the take out on VA 56 at Masssies Mill. Canoe & Kayak: Canoe and kayak on the beautiful and historic James River Basin. James River Float Company offers canoeing for everyone from novice to whitewater champ, from fisherman to excursionist. Whether you want the thrill of fast water or the relaxation of slow, lazy paddling, whether you’re looking for big game fish or beautiful scenery, they have a trip for you. Open year round. May 1 to September 30, 9:00 a.m. to 5:00 p.m. Seven days a week. October 1 to April 30 by appointment. When water conditions on the river are too dangerous James River Float Company is closed. James River Float Company 122 Rocky Hill Road Madison Heights, VA, 24572 (434)-846-8823. 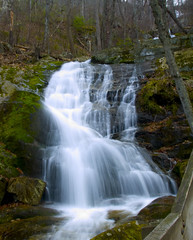 Crab Tree Falls: is The Old Dominion’s best kept secret. Located midway between Charlottesville and Lynchburg, Virginia, just six miles off the scenic Blue Ridge Parkway, Crabtree Falls is the largest vertical drop waterfall east of the Mississippi River. 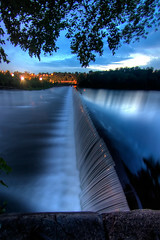 Hikers, backpackers and campers enjoy miles of nature trails in the falls area. The trails of the falls lead hikers up to where the trail meets the Appalachian Trail. The falls trails lead hikers along a rigorous five-mile loop which offers stunning views of the five cascades of Crabtree Falls. The vertical drop totals over 1,500 feet! Located in the George Washington National Forest, Crabtree Falls Nature Center and parking area is located on state route 56, just 19 miles west of U. S. Highway 29 in Nelson County, Virginia or 6 miles east of the intersection of state route 56 and the Blue Ridge Parkway. There is a fee to park your car. Walking tour of Historic Districts: This self-guided tour will encompass the Historic Districts of Lynchburg to include: Daniels Hill (home of the Carriage House Inn Bed and Breakfast), Federal Hill, Garland Hill, Diamond Hill and Court House Hill. Rivermont is another of our historic districts but that is easier to see by car. These neighborhoods were founded in the late 1800’s and have a wide variety of architecture to appreciate. Many of the homes in these districts are undergoing restoration. Because all of the districts are in neighborhoods registered with the Department of the Interior as Historical Districts, owners are required to follow strict guidelines in the restoration of these homes so that future generations can enjoy them as they were originally built. If you enjoy viewing this type of architecture you will want to return to Lynchburg to participate in the Tour of Historic Homes (each September, see our calendar of events for exact dates) where you will be able to get inside a number of homes. Likewise, there is a walking Ghost Tour Halloween weekend each year with some interesting stories and finally at Christmas there is typically a tour of the interior of several homes. Make sure you pick up your pamphlet of historic homes (which describes only about a third of the historic homes in these neighborhoods) before you start your tour. 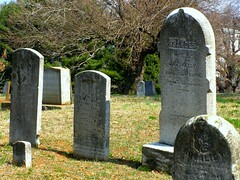 Walking tour of The Old City Cemetery: From June-August there is a guided tour of the Old City Cemetery. Meet right inside the gate and you will be given a guided tour of the cemetery and learn lots of interesting facts. There is no fee for this tour! In October there is another tour which typically costs about $10.00 per person that also goes over the history of the Cemetery as well as the trees and birds in the cemetery. Also in October is the candlelight tour of the cemetery which requires advance tickets and this tour sells out quickly. Natural Bridge: as formed when a cavern collapsed and left the span that stands today. Monacan Indian legend has it that Natural Bridge appeared just as they needed to escape from an advancing enemy. A young George Washington surveyed the Natural Bridge site for Lord Fairfax. Landmarks remain of the work and on the wall of the bridge where he carved his initials. Just before the American Revolution and writing of the Declaration of Independence, Thomas Jefferson purchased 157 acres of land including the Natural Bridge from King George III of England for 20 shillings. It has remained privately owned. Its development as a retreat began when Jefferson built a two room log cabin – one room was reserved for guests. In 1833, Jefferson’s heirs sold the site and the new owner erected the Forest Inn to accommodate the increasing number of people. During the 1880’s Natural Bridge attained resort status under the ownership of Colonel Henry Parsons. The Rocky Balboa Workout: As I’m putting this list together I just created this one, but if you are up for a challenging workout. When you leave the Carriage House Inn, jog down the hill to the end of the street, cross over the pedestrian bridge and bear to the left on the other side of the bridge. This will take you downtown. When you get to 9th Street jog up the HILL. If you still have any energy left when you get to Church Street, jog up Monument Terrace (all 139 steps) which will put you on Court Street, just a few more steps to climb to the Old Lynchburg Courthouse, now a museum and you made it. After that workout you deserve to dance around on the steps of the Courthouse. Getting back to The Carriage House Inn is the easy part, head up Court Street, Turn right on 5th Street, Left onto Rivermont (at The Texas Inn) Right onto D Street (your first right after crossing the Rivermont Bridge–still no street sign) to the Carriage House Inn B and B, located at the corner of D and Cabell Street. It’s only about 2 miles but the 1/4 mile trip up 9th Street makes this the most strenuous 2 miles you have ever done. When you get back we have the “Rocky” video available for you to watch as you cool down. Blue Ridge: A network of hiking trails run off the Blue Ridge Parkway. Bring a picnic lunch and enjoy Mother Nature at her best. If you aren’t in a hurry, take the scenic drive along the Blue Ridge Parkway and don’t forget to stop at all the scenic overlooks. Bring your camera and plan on spending the day photographing the rocks, colors, streams, sunsets and sunrises, and wildlife.